Note: Comments are now closed as the puppy has arrived and has been named. Click here to find out what we call him. Thanks to everyone who suggested names!! Although I’ve really wanted one, I haven’t had a dog of my own since I was in my early teens. My excuses included being single, constantly on the road and in hotels… yada, yada, yada. 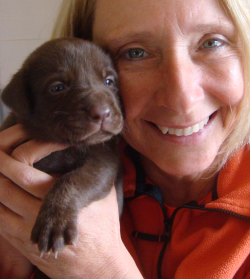 I’m getting a Chocolate Labrador retriever puppy in 5 weeks and I can barely contain my enthusiasm! Granted, that should be ‘we’ as my friend Ed will be co-parenting, but I’ll be its adopted mommy, primary cuddler / walker / trainer and companion. Shown right is a pic taken today of one of the pups from the litter, at just 24 days old. Now here’s the problem. We can’t decide on a name. Not sure I am an expert in this area but I like Webber. My childhood dog was Lassie, so I know how your feel. How about Meesha.. That’s what she makes me think of when I look at her lol For what it’s worth.. good luck with the name game Rosalind. How cute!! Labs are the best dog you can have (IMHO). They are very playful and loyal and make wonderful buddies! I have a friend who named her chocolate lab “Cappucino” (but she usually just calls her Cappi) – so I vote for the similar name “Mocha”. Hi Ros! For a good 6 week span I was itching to take steps towards getting a Siberian Husky… it’s the only dog that I’ve ever felt would be perfect for me. Then I baby-sat a Cane Corso for 6 hours and realized I’m not ready for doggie fatherhood. But I had a name picked out that would have been perfect: Lycan. Not quite as soft and cuddly sounding as “Riley” or “Mocca”, granted. So it’s probably not a fit for yours. But Lycan (man-wolf) is a name I’ll have to give at least to a house plant one day (though I’m not ready for house-plant fatherhood yet either) because I’m definitely in love with the name. But “Bob”? That’s just mean … the other dogs would tease him all his years. Oh man… what great comments and suggestions to wake up to this morning! The “Rob’s” had me splitting a gut… Lassie and not ready for plant parenthood, let alone doggy fatherhood. Keep ’em coming. You’re giving me some great ideas! With your last job in mind the dogs name has to be “Radar”…. How about Fudger (Fudgie for short). I used to raise Bernese Mountain Dogs…such fabulous creatures! I like Riley. I also like the name Dakota. I have a a black lab he is 122 lb baby. I grew up with cats and he is my first dog. I got him when he was 6 mos old. For the first 2 years a lab is very challenging but if you can make it throught the first two years they are the greatest! Enjoy! What a great choice for a dog! My first dog, Mickie was a yellow lab. She had such a great disposition. As far as the name for your chocolate lab puppy, Webber is a perfect name . . . . I mean, that’s you! I think it’s a perfect way to bond with your dog, by naming him after you or something you’re interested in. My vote is for Webber. Yeah, as a kid we had a working brown dog on our farm…like a lot of Australians, we stuck ‘ie’ on the end of a word and called him ‘brownie’ and his nichname was ‘brown dog’. …always go for the cheap laugh. We have a chocolate cocker spaniel named CoCo! Being in the doggie business for more than 18 years, i would first make a suggestion that you keep the name short and easy to say. No tongue twisters, makes it much easier to use giving commands later in your pups life. And now for my suggestions on a name. We hae a yellow lab named Bailey, as in b n cream. Since you like to travel, how bout Rocky Road? Or Traveler? Anyway, great choice. Labs are wonderful. Watch his rear legs, as the knee tendons can rupture. Ours ruptured one of his, as we let him play to hard on the beach sand when he was a pup. We had to have it rebuilt. They used fine nylon. Runs great now, but the other one is week. Vet said it was because they are tending to breed them with more upright rear legs to counter the hip displasia problem. Don’t know, but they are wonderful loyal companions. Or how bout Sinbad, if its a boy. Or Cocao/Cocoa, if its a girl. Snicker, Sam (after Sam Adams dark beer), Heath, Truffle…. Good luck to you always! Love your sites! Rosalind , I raised Golden Retrievers for years and my favorite bud who passed not too long ago was named Chivas Regal II, affectionately called “Chivas”. I would be honored if your new 4 legged baby could follow in his paw steps. I hope you have glorious years of bonding together. First of all I’d like to ask you wether the puppy will be a little ‘boy’ or a ‘girl’, because I think it’s important for an apropriate name. I mean, Lizzy is not for a boy… etc. It is a chocolate lab. How about Choco? It is what I call distintive zing. (not sure where the LEE comes from, just SOUNDS GOOD!!!! Our Chocolate Lab will be 2 on April 5th. There are some pics of her on our site. Her name is Molly. But I will also suggest names of other dogs we’ve had. I couldn’t resist taking part in this, what an adorable photo. I had dogs which were named after their colour, Amber, Ebony, Inky, Ivory and then one called Emporer. All Chow chows. So since this is I think a chocolate puppy, I do rather like suggestion of Coco, it could also be spelt cocoa, if you want to relate it to a drink. My partner is sitting here with some ideas too. He suggests Chocs, Ripley, Gently and Bogart. I quite like Ripley. since he is a LAB dog, he should be called DOCTOR. My daughter has a yellow Lab and he is my “grand-dog.” Every time I call she has him to talk to “Grandma!” LOL 🙂 She loves her dog to pieces and I have to admit he is the most lovable grand-dog anyone could ever have. BTW, his name is Scout, but she calls him Scoutie, Scouters, Bubba, Bubbers… (well you get the idea). 😉 I know you are going to love having a Labrador as well. When I got my chocolate Lab, he was a 14-month-old rescue from the Ontario S.P.C.A. and came with the name Harley. Before the end of our first day, he became known as Moosie (for Chocolate Mousse). Now age eleven, he is my heart-dog, and Moosie he remains. My recommendation…find a really good trainer, and start obedience training immediately. Puppies learn most quickly between 2 and 6 months of age. Then they become teenagers, and once that happens, doG help you! LOL!! Looking at this pup and your scintillating smile, ‘Smiley’ would be good. My dog is my companion and you’ll feel the same way. Dogs are blessed creatures and we’re blessed to have them as pets and friends. A couple of names for a female dog: Coco, Truffles, Jasmine, the last is my dog’s name and it fits her perfectly. You can get quite a few nicknames from “Jasmine”-Jaz, Jazzy, Jaz Monster, etc. Male names that I like are: Scout, Ranger, Maverick, Nikita, Koda, Bear, etc. There’s a few good dog naming sites on the ‘net also if you’re looking for more choices. aww this is the cutest little guy i saw! No dogs in your life since your teens! How have you survived all these years? Lol. Never will you know such love as that which this fella will give you. How about “Affy” — For both affection, and Affiliate. Much happiness to you. I have two Labs named Charlie Brown (chocolate) and Joe Cool (yellow). I’m a big Peanuts fan! They can be quite a handful, but I love ’em anyway. I like the names “Radar” and “Rocky Road” that were suggested earlier. Enjoy your new baby!! Barney was a treasure and I miss him terribly. ‘Koa’ might be a good male name. It means brave, bold, fearless. ‘Hoku’ means Star in Hawaiian and might make a good female name. You should consider naming your new family member by its actions after you get the puppy. Most of the time they will name themselves by how they act and respond. We recently acquired a German Shepard that was a rescue dog and her name was Jade. After a few days we were always saying Jade-NO so you might look at the name and sound it out and what do you get. J-LO. She responds to that even better than Jade. like – Stacey (Stay-C) or Downie (Down-E) or Munchie (Munch-E). Good luck with your puppy, I know you two will be very happy! My mother always said I should have been raised on a farm. If I could have dogs everywhere, I would, and have never been without one or two at once. “Duke, Caesar, Jack, Nikki, and especially for “Sylvie” (Bear’s mom)who we lost last year. Is Hershy ’cause of his softmouth , chocolatly smooth color and intellegent look in his eyes. 2nd. He is a Lab and they are very sweet and smooth, playful, loyal and entertaining bread of dog I have know ( and I have known quite a few ) though if yours is anything like the one I have now (an cross of and yellow and chocolate lab) you will know what puppy love is. And since he is still a puppy while you are soaking up his sweetness he will be chewing up your new furniture… SoHershy come to mind cause he is sweet and will be stickin’ to your hips for a bit ( pocketbook that is ) for about a year till he grows out of it. so, with that in mind I recommend toys for him and lots of them most in perticular.. A Horse Ball, yes you read that right, A Horse Ball, as he grows h can carry it , chew it, play soccer with it while building hip and shoulder strenght and he will need it Lab’s are know to have weak hips.. so sorry to chat your “eyes off” Till Next Time, TTFN. But, I think your dog would “look good” as a Charlie. Charlie could be either boy or girl dog. There is also, “Dutches” or Chole…….or if you like “people names”, you could look for names in a name your baby book. There is also Ebony……..or Emma……..or create a name from the many that have been mentioned here, on this page. Hi Rosalind: Sparky would be a good name for a Male dog. Short and sweet. I like the name Shadow. If I have another dog I will name him that. Daisy if you get a girl. Name him Chip, as in Chocolate Chip. He’s a cutie. Lucky you! What a great idea to get a puppy. I got my first dog nearly six years ago when I was 51, and it was the best thing! Remember to take time to train your puppy, and of course a Labrador will be so much fun to train. For a name, I would go with something that represents what the dog is or means to you. I called my dog “Merry” (‘Merry Heart’)because that’s what she is, she is merry and sweet. P.S. I have your SAH, and I think it’s fabulous! Thanks for producing that. Lab’s are such great dogs!! I like “Hercules” or “Herc” for short. For your sake I hope the dog isn’t a “Sooner”… I can explain later if you like. I’ll bite, Joe. What’s a ‘Sooner’? Short names are good when it comes to training. I couldn’t help but add my two sense. How about Maverick or Coco. All the best on finding an name you can live with. I think the dog will respond to any name it’s called, because it will be so happy just to be with you. Very much inspired by the film Colour Purple I would say Olie. Wishing him a healthy long life. Seeing as it’s a retriever – Why not call it Fetch? or because of the chocolate colour – Cadbury or Kraft? another great colour name of course…. Muddy? But then again, I did call my two dogs Kiah (female alsatian) and Cosmo (male Pyrenean rough faced) – still not sure why…. @Carol – Shadow is a great name! That is what I named my black lab and it fits her perfectly. She’s always right by my side. hmmm, did i say “Bouncer” already, lol, or how bout “Choco”, or “Pippin”, lol, so cute, makes me want to get a puppy, too! How about Yogi or Nelson? Names are tough, because you always wish you’d waited 6 months to get to know their personality better. I’ve had a couple of dogs who should have been named “Hoover” for the vacuum cleaner (they didn’t eat their food, they inhaled it). Ahem, anyway, how about – Buster, as in, NOOOO BUSTER!!! Which reminds me, I actually know someone who changed her dog’s name to NOOOO!!! You probably don’t need an explanation. Good luck with the puppy, they’re a handful. Good luck with your new puppy! Of the names above, I vote for Simba, but here are a few other ideas I don’t recall seeing. We named our puppy “Angel”. He is all white and pure joy! It will bring many happiness in the future, as you are happy already. Puppies do that. So for that reason you should name it Happiness, but in East African word. Name it “Desta” means Happiness, more laughter, happy occasion. For some reason the name Walden jumps out and reminds me of Henry Thoreau and his affiliation to those who believed that “a life unexamined was not worth living”. Trust me…the new dog will listen faithfully as you discuss every aspect of your life with him. All of my dogs have, and I think I’m a better person for it. You will LOVE owning a Lab… or should I say he or she will love owning you:) Labs are the most loyal, loving, and smart canine companions ever. We had a chocolate lab named, Bailey. He was such a big part of our family until the day that he passed away. We now have a black female named, Ellie Mae. She is just as sweet and loyal as Bailey was. Both love to swim and go for long walks. Labs are very active and require lots of exercise so be prepared for that. Bailey use to swim in our fish pond like twenty to thirty minutes without ever coming to the side. He was like a fish. If I could suggest one thing, that would be to start training with a clicker from the very start. When we brought Ellie home, we had a trainer come to our home for a new puppy consultation. He taught us how to use a clicker for basic obedience training. She had the sit and come command down pat within the hour he was there. Clicker training works like a charm and you don’t have to us the clicker for long. I’m so excited for you and wish you years of enjoyment with your new little fur baby. Sir Oliver Garder of Szajniak. A bit prtencious for a dog, but you can call him “Ollie” for short. Whenever I’d hear a name I liked, I’d write it down, lol. Best Wishes to you and your new pup. TIMBER! I love that name for a Lab! Our dog is a beagle named Bayley. Not that I’m biased (of course) but I kinda like the name … Rocky! Some of you folks have some strange ideas for names – can you imagine yelling out “Puck!” in the park??? I do like the suggestions Walden, Shadow and Oliver and my own suggestions, Willow, Leda and Siren (or Seren even which is Welsh for ‘star’). But it’s such a personal thing. I am in the process of writing a children’s book, about a squirrel named Chester, a Beagle dog named George, a panther named Samson, and a bobcat named Samantha. I think you should name your puppy Samson 2, because when he grows up, he will be a strong and beautiful creature, like my panther, Samson. I used to have chocolate labs, my first was named Coco, our second I named Sabrina, and when she had a litter we kept the runt and named her Chelsea. We loved our labs as much as we love our children. When Chelsea passed on my wife and I said never again, we could never put ourselves through loosing another pet. Now, almost 10 years later we have adopted our sons Pit-bull terrier and her name is Nali – I guess what I’m trying to say is that it doesn’t matter what you name your pet, as long as you can give them your unconditional love. How about Hot Chocolate? You could shorten it to Choco, or Hot Choc (sounds rather like Hotshot). Anyway, whatever you call him, enjoy! Never name a dog anything that rhymes with “NO.” Such as Bo or Snow or Joe etc.